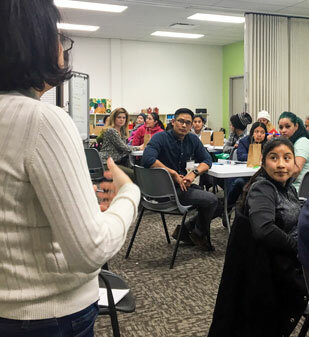 The new semester of YHI (Yo Hablo Ingles English Language Learning classes) has launched! Adults from the community filled our entryway as they lined up for orientation. Excitement swirled through the winter air as many new students arrived to begin this new journey. By the end of the semester they will have gained important English skills, learned through collaboration and engaged in leadership building exercises. Thanks to your support we are walking alongside our neighbors as they begin new journeys. Through those new journeys, we build new relationships and with those continuing on the journey, we continue to develop relationships that go deeper and stronger, in our relationship with God and one another.